2019 Squier Classic Vibe '70s Jaguar - still good? ...but is the build quality still there? That remains to be seen. More on that in a moment. For now I'm concentrating on the Jaguar since this one has the most obvious changes compared to the Vintage Modified version. Most of the changes to the Jag are good ones. The switch from basswood to poplar should mean that screws will not strip the wood as easily, as basswood is soft by nature. Neck binding is always cool on a Jag, no complaints there. The switch of nut material is also welcome as the old plastic nut gummed up fairly easily. Neck tinting also looks great. However, four things stick out that concern me. Narrow/tall frets may not work so great on a Jag. The Jag is already a buzzy guitar by nature, and putting narrow/tall frets on it may cause even more fret buzz. The old Duncan Designed JG-101 pickups on the Vintage Modified Jaguar really sounded good, and had a nice full sound to them. The change to AlNiCo may have not been the best move, but time will tell on that one. The saddle change from traditional Jaguar to Mustang was just plain stupid, but there they are. This is Fender/Squier capitulating to dumb players who play their guitars caveman-style and constantly knock the strings out of the saddle grooves. 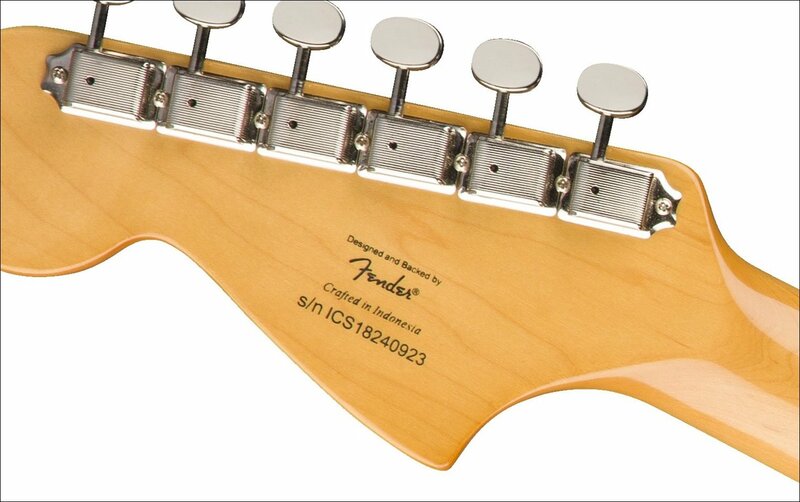 Ever since Classic Vibe was introduced, all the guitars were made in China, or "Crafted in China", as it were. And it was done in a way where some high quality work went into production of CV guitars. The CVs made in China are great and always have been. However, the '70s CV guitars are made in Indonesia. Why does this matter? It's because the Vintage Modified series has always been made in Indonesia, and from my experience, Crafted-in-Indonesia Vintage Modified Squiers are a notable step down in build quality compared to Crafted-in-China Classic Vibe Squiers. What this ultimately means is that now you're paying Classic Vibe prices for a Vintage Modified level of build quality. But maybe I'm wrong. Maybe these '70s Classic Vibe models have the same build quality as the China CV guitars. I hope I am wrong, because otherwise, guitar players who buy this Jag are going to scream really loudly that they paid $400 for crap. I really want this guitar to not be crap. Hopefully, it won't be.